Imagine you're walking down the busy streets of Washington, D.C. The Sidewalks are wide. Sights are plentiful. You pass an advertisement hanging on the wall. It's only 3 feet away and hangs in your field of vision for about a second and a half as you pass by. Will the poster actually persuade you? Let's test it. Here's the real poster I saw. Take a second or two. Look it over. Then scroll down until you can't see it. Go! Now scroll down. Can you no longer see the photo? Do you have any idea what the ad's message is? In the time it takes to pass a poster on the street, the poster must grab our attention so effectively that we actually take time to read the words. And the entire message must become clear in less than 2 seconds. The secret is in the photo. It's meaning must be clear, even without the words. The photo must stand alone, because that's how our eyes see it, with just a glance. We see the photo first. If the photo's boring, we don't even notice the poster. Our eyes move on. Whatever the message is you want to convey, it must start with the photo. The poster is forgotten. It's sad to see them wasting resources, paying for advertising space that isn't communicating effectively. 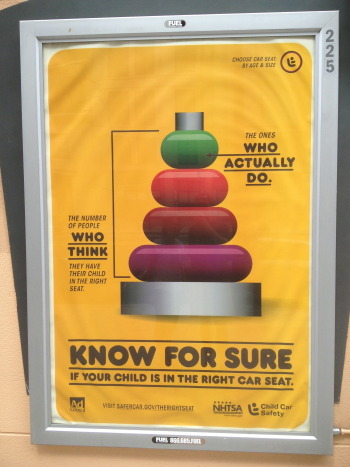 But what if the poster could remind us of our own kids? Now that might inspire us to stop and think. Our children's safety is probably the most important thing in this life. We might even stop to think! Wouldn't that be cool. So what's the message this poster really wants to tell? Maybe it's, "Your child might be in danger! 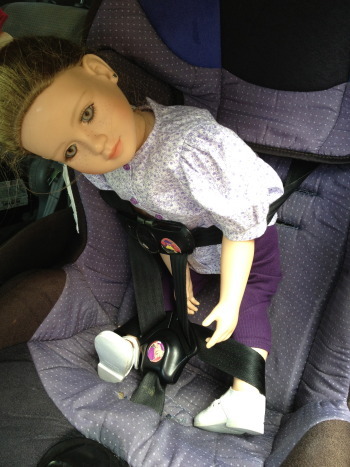 Please double check your carseat's installation... Today!!!!" WHEN CHILD SAFETY SEATS FAIL! Looking at the poster, we see an imaginary child in danger and our imagination makes it real by placing our own child into the situation. Suddenly the idea comes together. "OMG! My child could break a leg if I don't get the straps just right!!" And we take action! As a result, our child is safer. The poster is successful. Their investment gets a great return. Whatever your message, make sure every poster you create is built photo first. Your message starts in the photo. Then, once you have our attention, you can use a few words to help us understand what to do next.